Explore hidden gems such as Hazratganj and Janeshwar Mishra Park. For shopping fun, head to Phoenix United Mall or Hussainabad Picture Gallery. Plan for a day of cool, family-friendly fun on the 12th (Tue) at Dream World Water Park. There's still lots to do: steep yourself in history at Rumi Darwaza, admire all the interesting features of La Martiniere College, stroll through Dr. Ram Manohar Lohia Park, and admire the landmark architecture of Constantia House. To see reviews, other places to visit, more things to do, and tourist information, read Lucknow driving holiday planning tool . New Delhi to Lucknow is an approximately 3.5-hour flight. You can also do a combination of flight and bus; or drive. 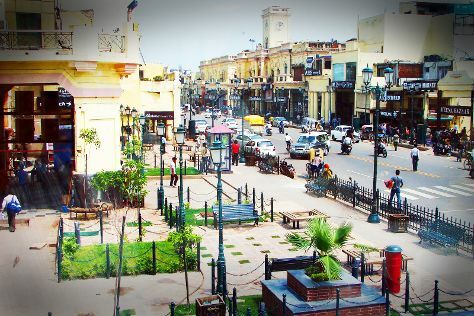 In February, daily temperatures in Lucknow can reach 30°C, while at night they dip to 12°C. Wrap up your sightseeing on the 19th (Tue) early enough to travel to Jodhpur. Your day-by-day itinerary now includes Mehrangarh Fort. On the 20th (Sun), pause for some photo ops at Jaswant Thada, contemplate the long history of Mehrangarh Fort, then look for gifts at Spice Paradise, and finally take in the spiritual surroundings of Kunj Bihari Temple. On the next day, relax and rejuvenate at some of the top local wellness centers, examine the collection at Umaid Bhawan Palace Museum, and then see exotic creatures in open habitats at a safari tour. To find where to stay, other places to visit, ratings, and more tourist information, use the Jodhpur itinerary planner . You can fly from Lucknow to Jodhpur in 4 hours. Alternatively, you can drive; or take a train. While traveling from Lucknow, expect a bit warmer days and about the same nights in Jodhpur, ranging from highs of 29°C to lows of 11°C. Wrap up your sightseeing by early afternoon on the 22nd (Tue) to allow time for travel back home.